Is Bronco will be back? Ford reportedly will reintroduce their mainstay sport utility vehicle (SUV) in the past, Bronco. This information comes from the United Automobile Workers (UAW). As quoted from Autoblog on Thursday, October 6, 2016, Bill Johnson, chairman of local UAW said, "We hate to see our products go to Mexico, but for the presence of Ranger and Bronco in Michigan factories, the future of our people is guaranteed better than Focus can be done." Previously, Ford confirmed will move production of some models such as the Focus and C-Max to Mexico. According to the company, by moving to Mexico the production cost can be suppressed. One reason is the Mexican labor costs are lower, so the profit margin obtained can be higher. Certainty is once again reaffirms Ford's commitment to their investment in the United States. According to Johnson, this is not confidential company's information. He said that the Ford management plans to revive the Bronco and already informed to all UAW leaders since last year. Furthermore, he said that the Bronco will begin production in early 2020. 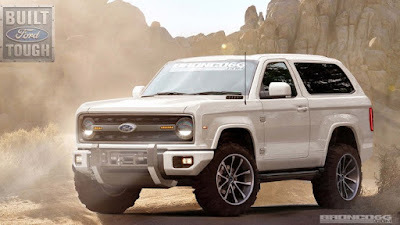 Bronco, he said, will be a new version of the Ranger pickup. So far, that's the only information is known. No additional information, including about the design of the vehicle, as well as the matter of the picture above. Pictured above is the fans rendering image as quoted through Bronco6G. Ford Bronco was first introduced in 1966. The car is competing with the Jeep Wrangler. Until 1977, the Bronco still maintaining its compact two-door SUV design. In 1978, the second generation of Bronco born became the SUV's built with the F-150 platform.